Yesterday, during my yoga practice, the focus of our meditation was on gratitude. I thought of that meditation as I prepared this dish for breakfast this morning. Firstly, I thought about how grateful I was to have had the foresight to prepare my shrikhand the day before —a task that not only ensured that the intoxicating spices had ample time to develop and do that wonderful thing that only time and patience can do to dishes like this, but it also ensured that the saffron stained the yogurt, giving it its beautiful henna-like glow. I also thought fondly of the friend who introduced me to shrikhand many years ago. Shrikhand is a sweet Indian dish made from strained yogurt. It’s thick, creamy, flavored and perfumed with heady Indian spices. I also gave thanks to the visual beauty of the figs as I prepared them. I love this time of year as it’s season for these broad-bellied fruit. My heart swelled with gratitude not only at their sight, but also with the feel of their supple skins. And one can’t help but feel gratitude when presented with the sight of their deep roseate cores. As I gave thanks to the sights, tastes and textures of the breakfast ahead of me, I decided that the only sensible arrangement of my figs should be in the shape of a lotus. Namaste. 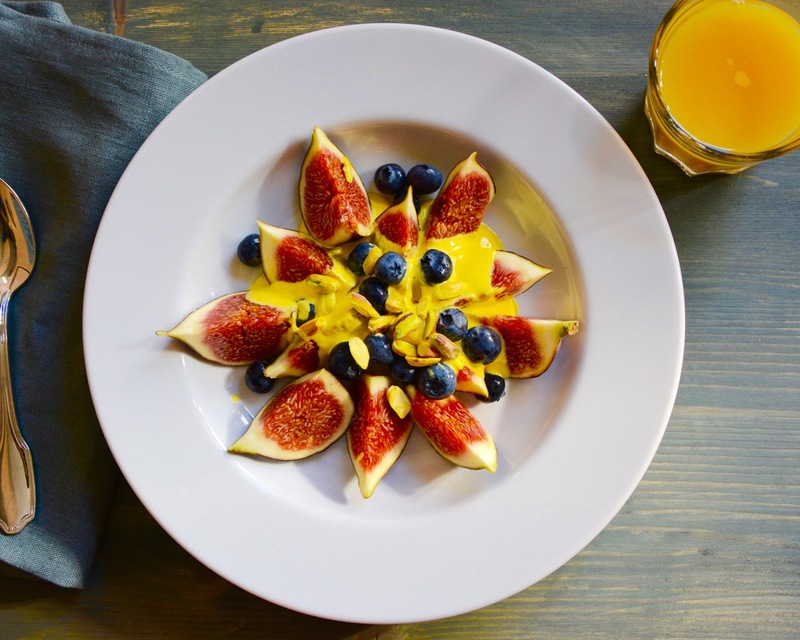 Arrange the figs in a bowl or plate however you see fit. 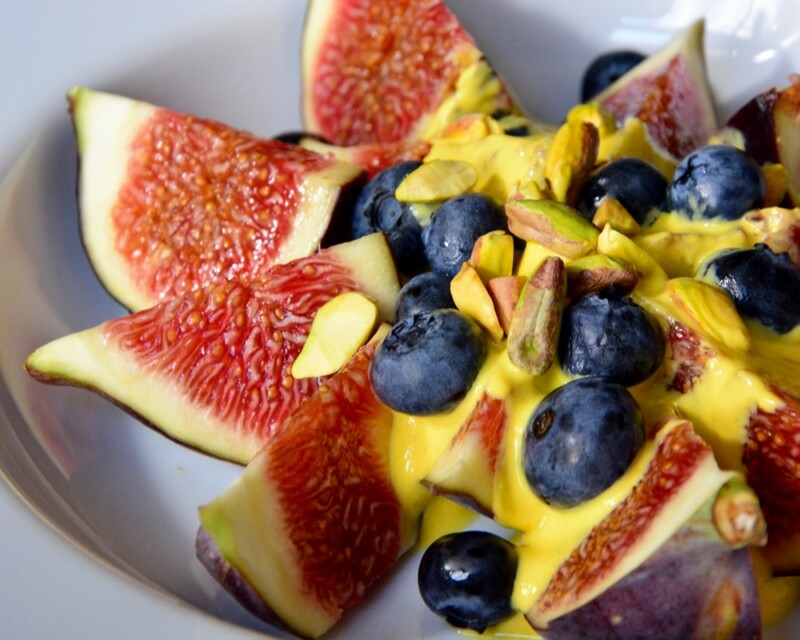 Plop the yogurt onto the figs. Then, scatter the blueberries, followed by the crunchy pistachios. Devour with a flood gratitude in your heart. Place the saffron in a small bowl along with the warm milk or water. Allow the warm liquid to leach out and release the color and flavor of the saffron, about 5 minutes. Then, combine the remaining ingredients along with the saffron mixture in a medium sized mixing bowl. Combine the mixture with a whisk, then store, covered, in the refrigerator for at least 4 hours to allow the flavors to develop. Serve cold with fruit or by itself with chopped pistachios or toasted slivered almonds. For a thicker shrikhand, strain the yogurt in a sieve lined with cheesecloth or double-line paper towels for up to four in the fridge.